From thought to finished product, we can create any design imaginable. 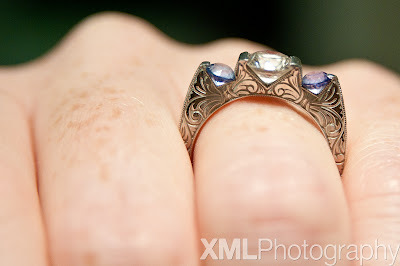 Engagement rings, like this hand engraved diamond and sapphire ring, are just one of the possibilities. We work with you every step of the way. Depending on the job, your piece will either be computer designed, or hand carved. Computer design affords us the benefit of making changes before the point of no return. 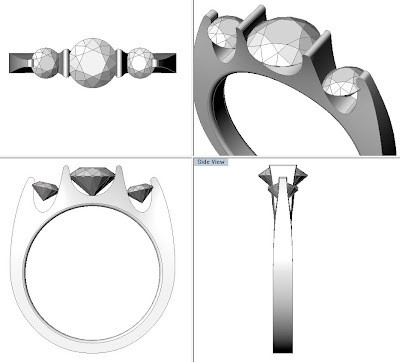 As you can see in the 3D render of this ring, at the beginning the stones had deep, U shaped cut outs under each of them. Since the engraving was to be the major focal point of the ring, beyond the stones, the customer and I decided it would be better to bring the metal all the way up to the stones. With computer rendering, the fix was easy to make. In the end it worked out nicely. 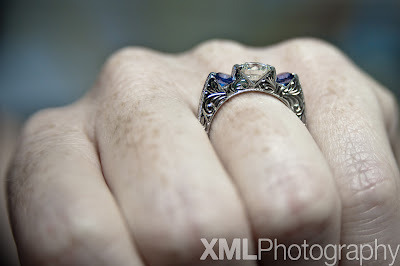 Custom jewelry design is our passion. We love our work, and it will show in the piece we make you.